Disclaimer: This page describes repairs I have made to various RVs in the hope that it will help others with similar problems. I am not a professional RV technician and I make no claims about the correctness, efficacy, or side-effects of the repairs described here. I won't be responsible for the results of any attempt to use the information on this page. The decision to mount RV refrigerators in a slide-out has opened up the design of motorhomes, but with a down side. In order for a refrigerator to function efficiently, heat must transfer from the tubes and fins on the back of the refrigerator to the surrounding air. That doesn't work very well if the surrounding air is as hot as the tubes and fins. Traditional RV refrigerators vent through the roof. The heat has a nice straight path up and out. With the refrigerator in the slide, however, the air is hopefully drawn in through the lower vent and out through the upper vent. It doesn't always work very well, especially on windy days, when traveling, or when the sun is on the slide. There are few simple things you can do to improve the efficiency of the fridge. An obvious one is to open the doors as infrequently and for as short a time as possible. Since the right-hand side of the cooling fins at the back of the fridge is the coldest, air drops from there down to the bottom of the fridge and tends to flow back up on the left. It helps if you don't pack your shelves in such a way that you impede that flow. Overfilling the fridge is bad, but covering one whole shelf with solid, flat objects like packages of meat is worse. 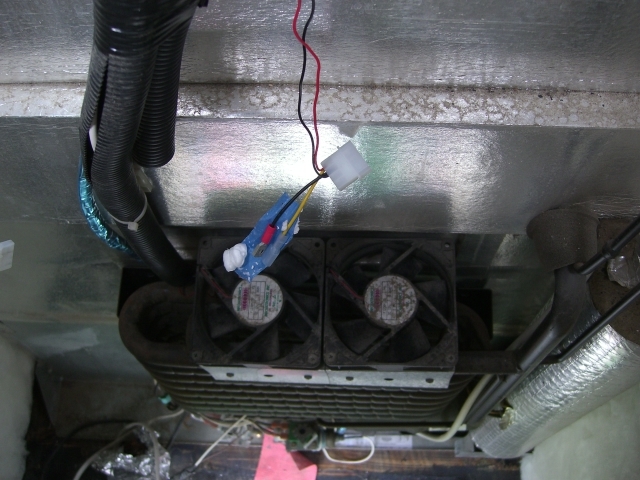 You can improve things by installing one of the small, battery-operated fridge fans to help keep the air circulating. You can put a remote thermometer in the fridge to monitor the temperature, but I'd recommend against it. It will drive you crazy. For one thing, the air in the fridge is not necessarily as cold as the items in there. If a beer in the fridge it at 38 degrees and you open the door, on an 8o degree day, the fridge will fill up with 80 degree air. A little later, the remote temperature gauge may read 70, but the beer may be at 39. If you could put the remote sensor inside the beer, it would be great, but it would probably ruin the beer. Putting the remote sensor inside a plastic container might help, but another problem with the remote sensor is that many modern refrigerators warm up periodically to dissipate the ice on the cooling fins. The air in them can get up to 50 or 60 degrees, which makes you think something is wrong when it isn't. A great tip I got from Scott Brownstein is to turn your fridge off briefly, then back on around midnight. You only need to do this once each time you leave home in the rig. From then on, according to Scott, the warming cycle will happen in the middle of the night when, hopefully, you're not opening the doors (or drinking beer). If the ideas above don't solve your problem, it's time to suspect the fans. To help with the process of heat transfer, two OEM fans (very loud, in my case) are mounted on the back of the coils. They help push the air up and out, although a strong side wind can interfere with the process. If you stand outside on a hot day when the fridge is on AC, you should be able to hear them. They only come on when the temperature in the coils reaches a certain point. 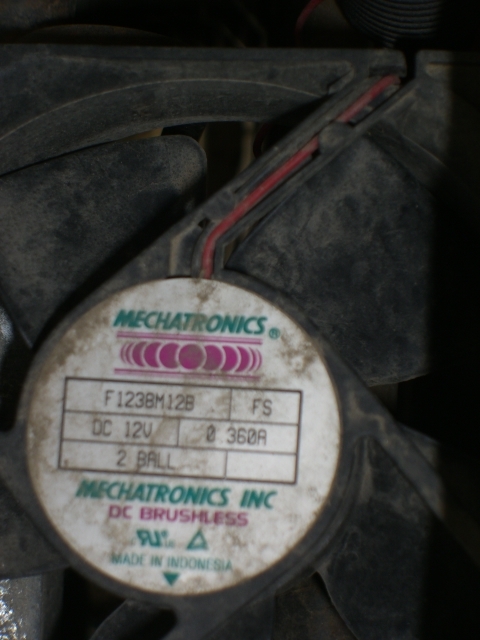 Here's a picture (from above) of the original fans on the back of my Norcold 1200-LRIM. You'll also see some temporary wiring of my own hanging out. Each fan is held in place with just two screws on the outboard side of the fan (bottom in the picture). If your freezer is cooling properly but the refrigerator is not, there's a good chance that your fans are not working or that the thermal disk that controls them is bad. On my fridge, the thermal disk is mounted at the right end of the cooling fins at the top of the compartment (accessible through the upper vent outside). If you see two wires near the top of the outside compartment that are not in the wire bundle, they probably go to the thermal disk. If your fans aren't running, you can try shorting across the two terminals of the thermal disk using a short wire with alligator clips on it. Be very careful not to create a circuit from the hot side to a ground, however, as that will blow the fuse on the circuit board. Be aware, too, that the coils can get very hot and it's easy to burn yourself. If the fridge is on, shorting across the thermal disk will turn on the fans and you'll know that the fans themselves are good (and the disk may be bad, depending on the current temp at the disk). If the fans don't come on, or if only one does, the problem is with the fan(s). Replacing the fans is not too difficult. In theory, you can do it with the fridge in place, but it's a lot easier if you pull the fridge forward about six inches. Not only are they standard computer fans, mine had standard computer plugs on the end, so replacing them was pretty much plug-and-play after removing the tape from the wires. To pull the fridge, I first turned it off and let the coils cool down to avoid burns. Then I unplugged the AC power to the coach, closed the LP valve at the tank, and turned off the master 12V power switch. It think it's probably not a bad idea to close the LP valve earlier, while the fridge is running on LP and use up the fuel in the line, but I didn't think of it until later. After opening the fridge doors, I popped the plastic caps off the screws at the top and bottom of the door and removed the screws. When you put these screws back, be very careful because they're going into very soft wood and it's easy to strip them. If that happens, shove two or three half toothpicks into the hole before replacing the screw. I finally pulled the fridge all the way out and added a piece of oak trim behind the original wood so I'd have something solid to run them into. Next, I closed the fridge doors. There's also a short screw or two on the outside that go down through the metal plate at the bottom into the wood below the base plate of the fridge. On mine, it was a single screw near the middle, but if you have the inside screws out and the fridge won't move, look for a screw you missed on the outside. At this point, the official method is to disconnect the LP line, the ice maker supply line, and the 12V supply, but I found I could get the fridge out far enough to work after just disconnecting the 12V lines on the board at the back. Be very sure that there's no 12v power to those wires first (or pull them one at a time and wrap them well in electrical tape). I'm not sure what the official method is for pulling the fridge, but what worked best for me was to put my fingers under the lip below the doors and pull. If you to that, spread your fingers out so the pressure is not all at one point. Putting the fridge back in is sometimes much harder. I found that the best method is to press my palms near the outside edges of the doors about two-thirds of the way up and rock the unit slightly from left-to-right as it goes in. Try to keep one side from getting too far ahead of the other side or it will jam in the opening. My OEM fans were rated at 120 CFM. I replaced them with SilenX 90 CFM fans, which are much quieter and probably more reliable, though more expensive as computer fans go. Mine were 120mm fans, but you should measure yours before ordering replacements. Be sure the air is being forced up through the fans, not down. I wasn't concerned about going down to 90 CFM, because I also added four more fans (sorry, no pictures of those yet). I also added a second thermal disk I got from Stu Snyder at Snyder's RV Refrigeration. The disk was part of a kit Stu makes to improve RV refrigeration. It's an ingenious idea using fans mounted on a housing made out of of PVC downspouts (pictured below). Unfortunately, it doesn't work for two-door refrigerators like mine. If you have a smaller fridge, however, it makes the fridge really efficient and almost completely silent. In the picture above, the white housing is covering the fins at the top of the outside compartment. It's actually two of Stu's kits held with plastic wire ties with caulk at the joint. These have since been removed. You can see Stu's thermal disk at the lower right with the two red wires going to it. It's held to the coil with two small hose clamps that came with the kit. I don't remember the temperature it closes at (I think it might be 110 degrees), but it's much lower than the OEM switch (which closes at 130 degrees). Basically, it's closed and the fans are running as soon at the fridge has been running for a little while and stays closed from then on. The OEM switch only closes on hot days. After replacing the two OEM fans, I added two more 120mm fans below the originals. They are on the back wall, mounted to a piece of L-shaped metal trim. Like the other fans, they push the air up. I also added two 80mm fans that I attached to the plastic vent at the top of the compartment. They attach very easily with plastic wire ties through the mounting fan holes wrapped around the fins in the plastic vent. The fans come with computer-style connectors on the ends of the wires. I cannibalized an old computer to add plugs on the inside to plug them into. The wires are long enough that I can take off the upper vent cover and put it on the roof without disconnecting them. The two OEM-replacement fans are still wired to the original thermal disk and only come on when it's hot out. The other four fans are wired to Stu's thermal disk and are on all the time. Ideally, I'd like to rewire them so that I could set which thermal disk controls each pair from inside the coach. On a cool day, you don't need any fans at all, so they if they ran off the original thermal disk, they'd never come on and I'd have a completely silent refrigerator. When I sit at my computer, my ears about two feet from the fans, so that would be nice, although the SilenX fans are much quieter than the OEM ones. When traveling, I'd like to have all six fans run off Stu's thermal disk so they'd be on all the time. On the advice of Scott Brownstein and others, I also added a whole lot of solid white styrofoam insulation in the back that forces the air to travel through the coils rather than around them. It's cut from 1.5" 4 x 8 sheets I got at Home Depot. Before adding the foam, I took a piece of it outside and tried to set fire to it with a torch. It melted (evaporated, actually), but it wouldn't ignite. I also added a metal baffle at the top of the outside compartment. It's made out of aluminum roof flashing and it curves from the back of the upper cooling fins to the place where the roof of the slide meets the outside wall above the vent. That helps force the heated air out the upper vent and keeps it from sitting in the dead air space above the fridge (which I also filled with foam). I have a photo of the flashing with measurements, but I can't find it. If it turns up, I'll post it here. 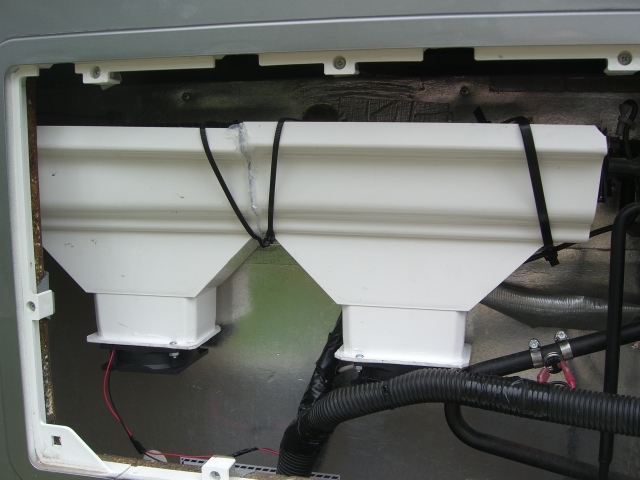 If you make the baffle in two overlapping pieces and it's the right size, you can install it easily through the top vent and it doesn't need any fasteners to hold it in place. In addition, I added a piece of foam on both sides of the fridge running from top to bottom. This makes it a bear to get the fridge back in, but it helps with both the efficiency and the noise. On a warm day with a strong wind from the left when I'm traveling, my fridge is still not quite as cold as I'd like it to be, but it's much colder than it used to be and it's a lot quieter. In all other conditions, it works great. All-in-all, though, I wish they had just designed the fridge properly to begin with.